Yes, this is an Arsenal-related blog. When you think "'C' Word" you would probably assume I'm talking about Robin Van Persie or Ashley Cole. But I'm talking about Cancer. Whether it's the person that has the disease or the friends and family that are close to them, Cancer affects so many. My Mother was diagnosed with Breast Cancer in October 2011 - I grew up as part of a very close-knit family, so as you would expect we were all shocked beyond belief. But we also initially thought it was one of the 'best' kind of cancers around. How wrong we were. It later emerged that my mother had Triple Negative Breast Cancer (TNBC), a particularly rare form of the disease, and as such, one that's more difficult to treat. We never got that 'all-clear' from the doctor following extensive chemotherapy, radiotherapy and surgery. I do remember going through the eye-of-the-storm, where things briefly returned to what we thought was 'normal', but when the call came from the doctor in October last year (12 months after being originally diagnosed) that her cancer had spread, the prognosis was grim. Being Triple Negative, Mum was given 6-12 months to live. She barely lasted 4, and on February 15th, the day in-between Valentines day and my Dad's birthday, she went to a better place. When I decided to go traveling, it wasn't so I could go and mooch other people's sofas and spend the majority of my time abroad shouting at numerous televisions, it was simply so that I could fulfil a lifelong wish to see more of this amazing planet, to get away from it all. I couldn't think of a better excuse to do it either. 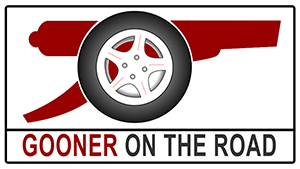 It wasn't until the Gooner On The Road idea was conceived, that I decided I would dedicate the trip to my mother and raise money for The Triple Negative Breast Cancer Foundation. The TNBC Foundation focuses exclusively on the form of disease that my Mother had. Researchers don't yet fully understand TNBC, so there aren't as many 'targeted therapies' available. The more funding they have, the more research they can do and the more chance they have of uncovering new ways of treating the disease. I'm raising £10,000 for the charity. If you have any interest in Arsenal or traveling, or you just want to witness somebody attempt to do something quite ridiculous (but entertaining), subscribe to my blog, follow me on Twitter and support me. And of course you can donate by clicking the Razoo link to the right (it's a bit like JustGiving, but because TNBCF is an American charity I have to fundraise in a different way). Finally, if you're an Arsenal fan and you would like to be a part of the GOTR mission (either by watching a match with me, or better yet giving up a sofa for me to crash on), you can Tweet me or send me a message on my Facebook page. Welcome Gooners, to my 2nd blog post. Firstly, I'd like to update you on recent developments at the hugely high-tech and top-secret GOTR Headquarters (located in my bedroom/office in Broughton, Milton Keynes, just off junction 14 of the M1). I now have a link (to the right, where it says 'PLEASE DONATE') for the charity fundraising. As I highlighted in my last post (and countless tweets) I'm doing all this for a good cause. At the moment I've raised $85 (about fifty quid) - that's some way off £10k, but I'm confident it'll pick up momentum as I become more active over the coming weeks and months. Remember, this is an American Charity so unfortunately there is no way to take advantage of Gift Aid. Oh, and there's a minimum donation of $10 (about seven of your British Pounds) which I'm sure you'll agree isn't much of an issue. Anyway, I hit 1,000 followers on Twitter this week (in a relatively short period of time). It definitely looks like I'm being warmly welcomed into the International Gooner Family Community, my itinerary is starting to look more viable by the day. At the moment though, there is still a particularly heavy emphasis on North America, where I have had offers to stay (and watch The Arse of course) in around 20 different States - plus a few provinces for the Canadians out there who are hopefully reading this (you don't have to put down a bong to read a blog). This does pose a slight problem, because I find myself trying to entertain every single one of those offers, and that leaves me short on time when Australia and South-East Asia come around - I am going to have to make some sacrifices along the way. Now, I became a huge fan of American Gooners the moment I set foot in The Blind Pig in New York City. For any keen Arsenal supporter, it's definitely a must-visit place, even if you're only in The Big Apple for a 'short weekend' with the wife. Trust me, that ball and chain can kick and scream all she wants, just take 90 minutes out from 5th avenue-hell and you'll thank me. It'll be the best sober decision you've ever made (after opting to stay at the Madjeski Stadium when we're 4-0 down). We'll catch up on The Blind Pig atmosphere in more detail in September, where I'll be Blogging and Tweeting, maybe live, depending on the degree of (non)verticalism that London Pride bestows upon me that afternoon. Before I head across the pond however, I've got the matter of attending the first match of the Premier League season against Villa, in person (anybody got a ticket?). This is where I'll be kicking off the 'show', before catching the Eurostar to Paris for the first leg of the Champions League 3rd round playoff (please let it not be Fenerbahce). After that I'll be making my way (somehow) to Prague in the Czech Republic for the Fulham Match. Then up to Berlin for the 2nd Playoff leg (hopefully we won't need a major effort) before my final European leg of GOTR in Gothenberg, Sweden, for the North London Derby on August 31st. And then, having only been on the road for two weeks, I would have already hit the first obstacle of my trip - The 'International Break'. When I say 'obstacle', it's actually not all that bad, as it gives me more or less two solid weeks between the last game in Europe, and my first game in North America, the latter of which I've still not decided on a venue - it's a toss-up between my 2nd home in Montreal, Boston (home of The Boston Gooners) and New York's infamous Blind Pig. I shall keep you all updated on the progress of the GOTR plot in due course. For now though, let's move away from 'The Travel Channel' and into something more relevant, something you're probably all too familiar about already. And some of you (like me) might be utterly sick to the stomach of it already. A lot of people have been asking how Lé Professeur will utilise Higuain in our current squad, and who will make way for him to come in. There is talk of Podolski and Giroud being pushed down the pecking order in favour of the Argentine, and quite a lot of you are getting hot and bothered by it. But, to be frank, it's a very good problem to have. We all know that position-competition is a good thing for a football club. Manchester City have this problem. They had (up until yesterday at least), Tevez, Aguero and Dzeko. And the season before last, they also had Balotelli. And they won the league. Across the other side of Manchester, the current Premier League Title holders had Wayne Rooney, Robin Van PurseStrings, Chicharito and Danny Welbeck to choose from last season. Even Higuain's current club Real Madrid have a healthy selection of strikers to choose from. Aside from him, they have Ronaldo, Benzema, Di Maria and Morata. They almost won La Liga. Essentially, the biggest clubs in Europe are the ones that have the best 'redundancy' in their strike-force. It means they can be more efficient with their forwards, especially if one goes on the treatment table for a few weeks. It also gives a team more options, either before or during a game - if you're chasing the match and you need to make last-ditch changes to put the score in your favour, your best bet is another striker or at least a game-changer. Last season, all our game-changers were already on the pitch. Yes, we need a DMF (Fellaini?) and another CB (Williams?) but the most important thing to remember when winning games (and competitions) is that you must score more goals than you let in. Attack is the best form of defence - we proved that in The Invincibles era. If we have 3 competent strikers on our books it's definitely a good thing. That's all for now. Remember to keep following me on the various Social Media feeds to the right, and spread the word.